This past weekend we checked out Camille Henrot’s The Restless Earth on view at the New Museum. We were particularly interested in this French artist’s ikebana-inspired series “Is it Possible to Be a Revolutionary and Like Flowers?” Using the language of ikebana, the Japanese art of flower arranging, Henrot “translated” books from her personal library into floral sculptures. Each arrangement includes a plaque listing a quote from the book that inspired it, materials and the Latin names of the flowers. Henrot associates ikebana with books since both can create a space for reflection, stimulation and comfort while serving as decorative, everyday objects. Practiced in Japan for over 600 years, Ikebana is a meditative practice of floral arranging guided by a highly refined design language. Although there are many different schools of ikebana—Henrot was following the Sogetsu tradition—most use empty space, asymmetrical compositions and seasonal materials as crucial design elements. While flower arranging in the West often focuses on the decorative beauty of flowers, ikebana arrangements may incorporate stems, withered leaves, grasses and the container into the composition. 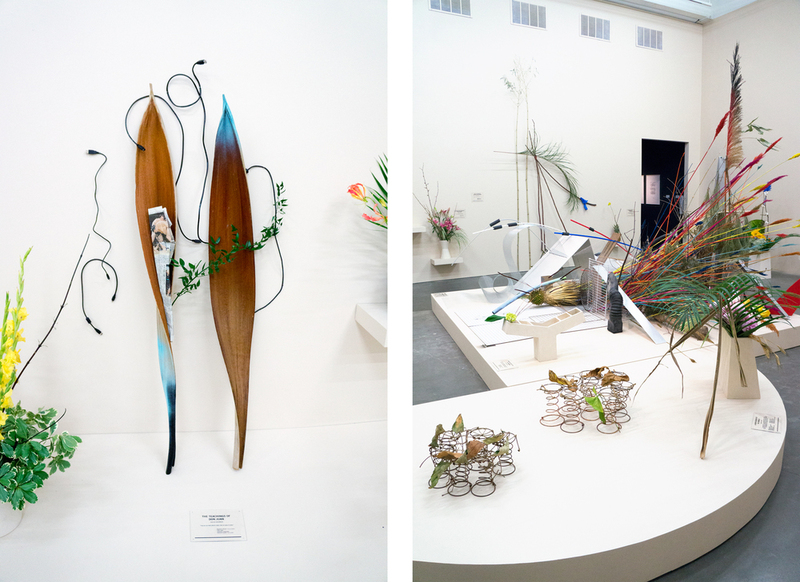 Resembling a futuristic flower shop, Henrot’s sculptures were comprised of exotic blooms, fruits, branches, stems and everyday objects such as usb cords, masking tape and newspaper clips. Delicately balanced in off-kilter compositions, the sculptures reflect the randomness and asymmetry found in both nature and life. We really enjoyed seeing this beautiful contemporary interpretation of a traditional Japanese art form. This installation was just one part of “The Restless Earth,” on view until June 29, 2014 at the New Museum.